The Amerks will wear special throwback jerseys along with matching socks inspired by the 1996 Calder Cup-winning team. The Rochester Americans announced the team’s festivities for its annual Hall of Fame Night, presented by Seneca Niagara Resort & Casino, scheduled for Friday, Feb. 8 when the Amerks host the Springfield Thunderbirds at 7:05 p.m. at The Blue Cross Arena. Janik spent five seasons patrolling the Rochester blueline from 2001 to 2006, establishing himself as one of the most dominant defensemen in franchise history. Janik recorded 91 points (18+73) over his five seasons with the club, ranking 31st all-time among Rochester blueliners, while also leading the Amerks to four straight playoff appearances. His 376 career games are the third-most of any defenseman and rank 14th all-time. He currently serves as an assistant coach with the Springfield Thunderbirds. The festivities begin on Friday with the Genesee Pregame Happy Hour, which runs from 6 to 7 p.m. in the Genesee Brew House Upper Atrium Bar, featuring live music from Tim Britt as well as $2 drafts of Genesee and Genesee Light. 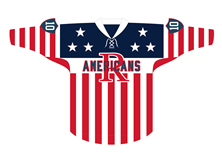 The Amerks will wear special throwback jerseys along with matching socks inspired by the 1996 Calder Cup-winning team featuring the alternating red and white stripes and navy-blue shoulders. The six white stars that adorn the shoulders represent the team’s six Calder Cup championships. The chest features the word “Americans” centered in front of a large “R” while navy-blue shields, which pay homage to the franchise’s early years, will display the player’s number on the upper arms. For more information, visit www.amerks.com/flexpacks or call 1-855-GO-AMERKS. Be the first to comment on "Amerks announce Hall of Fame Night festivities"